Lure Coursing Equipment - Made by INJOY - INJOY LURE COURSING EQUIPMENT....When you want the best, buy INJOY! For information on which string to order, click here! A soft vinyl cap used to make lures in a jiffy. The Tips have a preformed string hole and are larger in diameter to accommodate a fatter lure. They are convenient to use, reusable and safe for the hounds. The Voltmeter easily attaches to your lure stand. When connected to the solenoid, it provides a convenient way to monitor the voltage coming from your battery. When the voltage reading drops below 11 volts, it’s time to recharge or switch your battery. 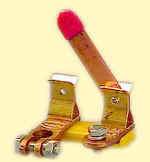 A thumb activated snap action switch with dust and moisture boot. This is an industrial rated switch and should hold up very well. Comes complete with 15 ft. cord and a receptacle for attaching to the solenoid. 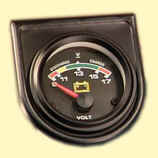 This is a 12 volt mechanical counter to be attached to the solenoid of your lure machine. The purpose for this gadget is to count the solenoid actuations or in other words...how many time you hit the button. This is handy for the individual wishing to practice preventative maintenance on their lure machine. ﻿﻿﻿﻿For more info﻿,﻿﻿﻿ click here. This is a heavy duty solenoid with silver plated contacts which is rated continuous duty. 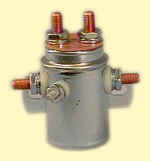 This is not an automotive type solenoid and is used in various commercial and industrial applications. Because of this, the base of the unit does not act as the ground. There are two small posts on the front of the solenoid and one (it does not matter which) needs to be connected to a ground and the other post is connected to the switch. For more info please read. Double acting solenoid used in the reversing lure machine. When a solenoid failure occurs, it is suggested that both solenoids be replaced at the same time. Nothing will spoil your day more than going to the trouble of changing one solenoid and having the other one fail shortly thereafter. Lure Machine Safety SwitchA quick and safe way to stop a lure machine when a solenoid or switch locks up. It also provides positive assurance to the lure mechanic that the lure machine will not start when they are working on it. The switch is rated for 750 AMP draw. Top Mount for connection to neg. (-) top post battery terminal. INJOY manufactures its own battery and connecting cables in-house using tin plated solid copper battery lugs and eyelets. Red and black #1 SAE wires are used to provide the best current flow possible. We will custom assemble your cabling requirements as shown below. Positive Terminal - large battery lug, red wire & eyelet with 5/16” hole. Negative Terminal - small battery lug, black wire & eyelet with 3/8” hole. Custom Length Cables are $11.00 for the first 16” and $ .35 per inch for each additional inch in length. You can specify lug and eyelet size and wire color at no additional charge. Cables With Eyelets on each end (16” long)........$8.00 each. Please specify eyelet size and wire color. Custom length cables are $8.00 for the first 16” and $ .35 per inch for each additional inch in length.